The region of Catalonia in Spain has a long history of doing things their own way. From the distinct languages to the autonomous legal standing within Spain, the area surrounding and including Barcelona in Northeastern Spain has forged it’s own unique traditions and culture. 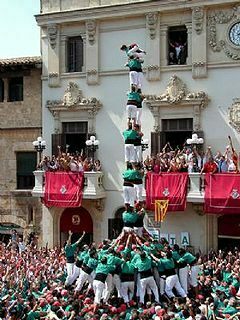 Among many unique traditions, this one that dates back to the 18th century is especially distinct, so much so that it has been recognized as a UNESCO “Masterpiece of the Oral and Intangible History of Humanity.” In town squares in several places in the region, they build towers up to ten levels high, made entirely of people. 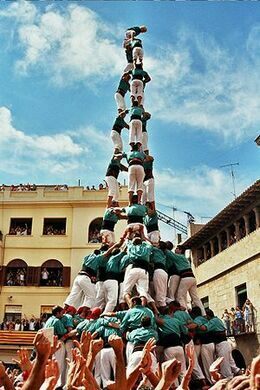 The sport of human tower building seems to be most popular in Vilafranca, where teams of people gather in the town square to build these monuments to courage, teamwork, and strength. Surrounded by thousands of cheering people, the Castellers slowly climb up the backs of the people at the bottom, until a multi-level structure has been built. Structures of up to ten levels are not uncommon. Although even a small error could cause the structure to topple, the strongest people are at the bottom ready to catch anyone who falls from the top. Replica of Seville, Spains famous Giralda, a former minaret converted into a bell tower. Hidden well off the beaten path in Catalonia is this crumbling medieval castle that is slowly being covered in graffiti.